Posted: November 25, 2016 Category: Vet Blog Post! Why Nikki, what beautiful teeth you have! 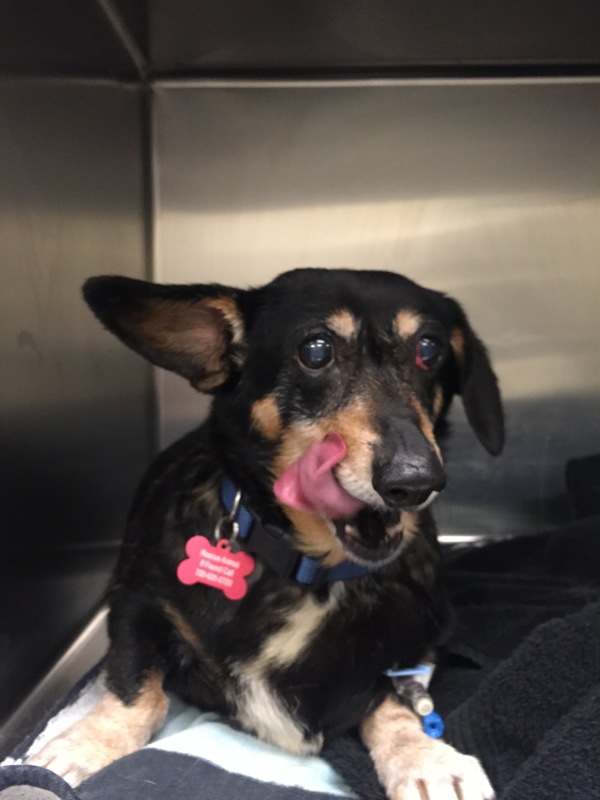 In our first installment, we learned about bladder stones, followed by the cherry eye in the second installment But sweet Nikki also had a broken tooth that needed removed at the same time! 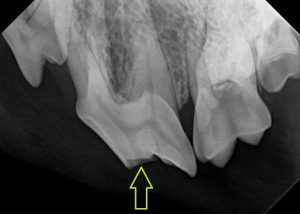 Broken teeth – how do they break, and how do I know if my pet has a broken tooth? Many breeds of dogs are prone to dental disease, either due to genetics or facial structure. Not only do short-muzzled (brachycephalic) breeds such as shih-tzus and pugs have dental disease from crowding of teeth, but also long-muzzled (dolichocephalic) breeds such as dachshunds have dental disease related to how food is trapped between their lips and teeth. 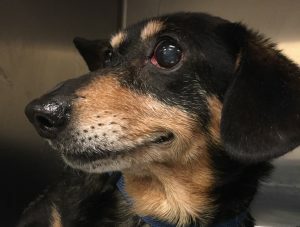 Nikki is an 8 year old dachshund, and we expected her to have several infected teeth that required removal because of her age and breed. However, when we did her exam before surgery, we noticed most of her teeth looked great. We did find, though, that she had a strong smell in her mouth, and she had much more tartar on the right side of her mouth than the left. This usually indicates that the dog is favoring one side of their mouth, and that infection might be present causing the strong odor. 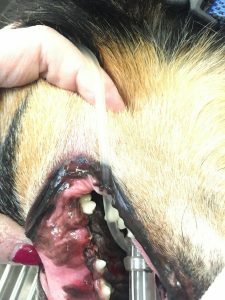 While Nikki was under anesthesia, we could take a closer look at her teeth and discovered that, beneath the dental tartar, there was a break in the crown (the shiny white visible part of the tooth) that involved the pulp cavity (the center nerve- and blood-vessel-filled part of the tooth. And just as we had hoped, the rest of her teeth were very healthy! Nikki’s tooth was broken badly enough that we could insert the tip of a probe into the sensitive center of the crown. The type of broken tooth can sometimes give us a clue to the cause of the fracture. The canine teeth (fang teeth) in dogs and cats often break when they are biting at something hard, such as a kennel door, or during a fight with another animal. Cats also commonly break the upper canines frequently when they jump from a high area, as their heads (and often their upper fang teeth) bounce down and hit the ground. The tooth that Nikki broke was a large tearing tooth (premolar) on the side of her mouth. Often these can break when a dog is chewing on something hard such as a bone, hard toy, a knotty branch, or a rock. Just as we can chip or break a tooth doing normal activities such as eating with a fork, dogs sometimes can break a tooth doing normal chewing on normal dog toys. When we break a tooth, we can break only the enamel (this is typically just a chipped tooth and is usually not painful) or further into the more sensitive part of the tooth. With only a superficial chip, sometimes no treatment is needed, but restorative treatments can be used on the teeth to help protect this area from further injury. Most severe (“complicated”) tooth fractures are painful and sources of infection – these must be addressed as soon as they are noticed, and are often considered emergencies due to the pain caused. In humans, we can either remove the tooth or perform a root canal on the tooth – in animals, these are both options as well. 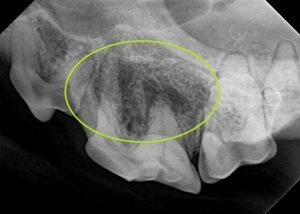 Root canals are done by board-certified veterinary dentists, and are important particularly in show dogs and working dogs to help preserve the appearance and function of the teeth. However, it is often much more affordable and practical in non-working pet dogs and cats to simply remove the tooth. The arrow points to the exposed root canal from Nikki’s tooth fracture. The circle shows the patchy, moth-eaten bone around the tooth roots, where infection has created bone loss. What happened with Nikki’s tooth? 3-rooted tooth, with all 3 roots going in slightly different directions, which helps to anchor the tooth into the jaw bone. 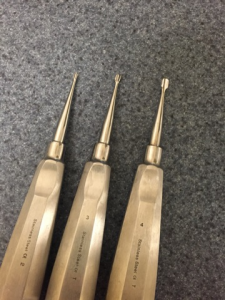 We have the divide the tooth with a dental drill into individual roots and remove each one separately. This is the dental unit used at Parkside, which contains the scaler, polisher, drill and flush that we need during a dental procedure. 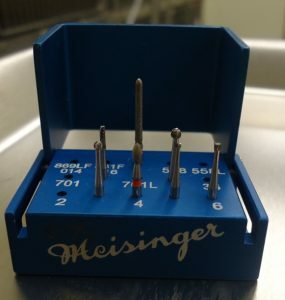 Dental burrs come in many sizes and shapes and help us to divide a tooth into sections and smooth or remove surrounding bone. 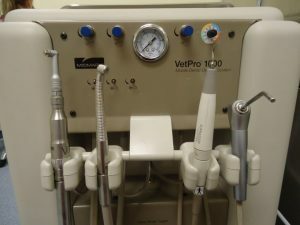 Dental luxators help to separate roots of teeth from the connective structures within the jaw bone. Once the roots have been removed, we confirm that there are no remaining fragments of tooth root left in the bone by post-surgical dental x-rays. We flush out and disinfect the areas where the infected roots had been. The bone is then smoothed over with a high speed dental burr, and the gingiva is closed over this extraction site with stitches of fine, absorbable suture. These stitches do not need to be removed, and by closing the gingiva over the extraction site we can help the mouth heal more quickly and protect the bone beneath from further infection. Once Nikki’s tooth was removed, the gingiva is sutured over the hole to allow faster and more comfortable healing. Nikki was treated with antibiotics due to the bone infection present in her mouth, as well as pain medication. During surgery we used a local anesthetic to numb that part of her mouth, and after anesthesia she received medications for several days to minimize pain and inflammation to the area. Most surgical sites within the mouth heal very quickly, and we expect her to be feeling much better within a week. 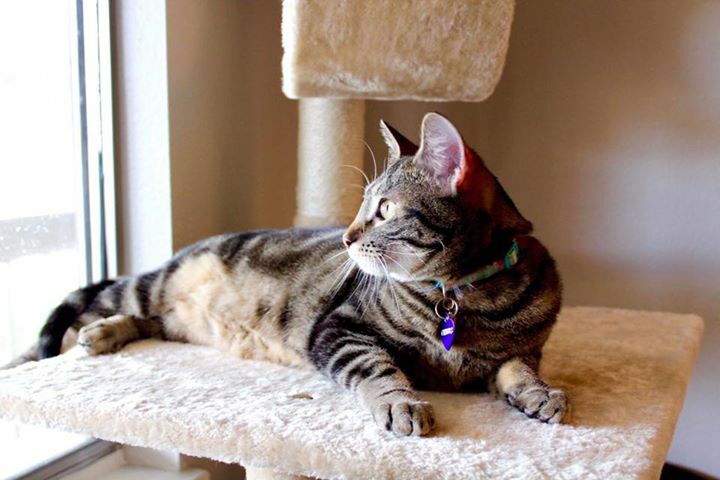 What should I check at home on my own pets? Just as with Nikki, your own pets can break their teeth. Dogs and cats rarely show clear symptoms of dental pain – they often have strong drives to continue eating regularly, and so broken or infected teeth are often unnoticed. Occasionally, with a fresh break, you might hear your pet cry or whine, or act differently while grabbing a toy, and rarely there can be some bleeding. Most often, however, a pet owner notices a broken tooth by comparing the teeth on one side of the mouth to the other. Symmetry in a mouth is normal, and any tooth that looks different between the right and left sides of the mouth could be broken. 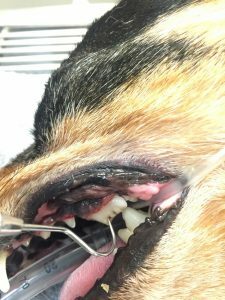 In addition, when a dog or cat develops more tartar on the teeth on one of the mouth versus the other, this is often because the animal is favoring that side of the mouth. Finally, a strong odor to the breath is never normal, and typically indicates infection either within the mouth or, occasionally, from the stomach or respiratory tract. If you notice any of these things at home, it is important to follow up with your veterinarian as soon as possible to help minimize pain and discomfort to your pet.